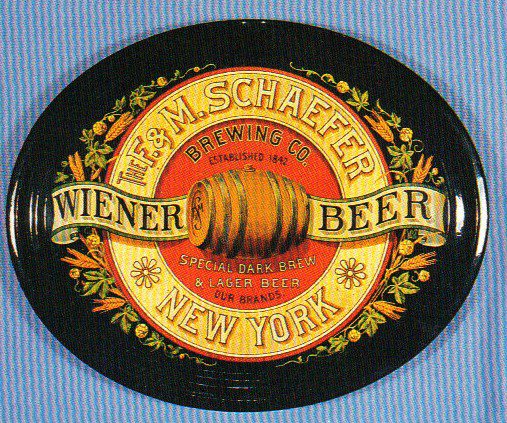 Serving Tray for Wiener Beer from The F.& M. Schaefer Brewing Company out of New York. A Barrel of the company’s brew in the center of this tray. Text under the barrels states “Special Dark Brew & Lager Beer Our Brands.” This tray has really great color and detail with all of the wheat and hops motif around the central medallion with the company name. This is the kind of attention to craftsmanship you only see in pre-prohibition trays and this 15″ x 12″ oval is a perfect example.